The Arduino microprocessor board has a simple design, containing an 8 to 32-bit microcontroller and software component that is programmable via a standard USB port. Since its inception in 2005, a large community of enthusiasts has formed to find new applications for the technology. The boards can be ordered fully assembled, allowing the user to then provide programming, or in DYI kits, for those who are adventurous and want to discover what applications can be created for the board. This is a set of instructions telling the Arduino to blink the onboard LED lights on and off at an interval of 500 milliseconds (delay = 500). It is also an insight into how the AVR chip, one of the components of the Arduino board, interacts between the programming language and how it is interpreted by the computer to create and carry out a command set. Although it is small, the Arduino microprocessor acts in the same manner as any other computer central processing unit (CPU). The AVR has a series of registers that are responsible for carrying out different tasks. The plain English set of commands that you read (as in the above example to blink the LED) is converted from its programming code into what is known as machine code, a series of “0s” and “1s”. These are generally interpreted in a line of 8 digits, which make up a byte. When the series of instructions are properly coded and interpreted by the processor, a command is carried out. The programming that enables the Arduino to carry out commands is called bitloaders. 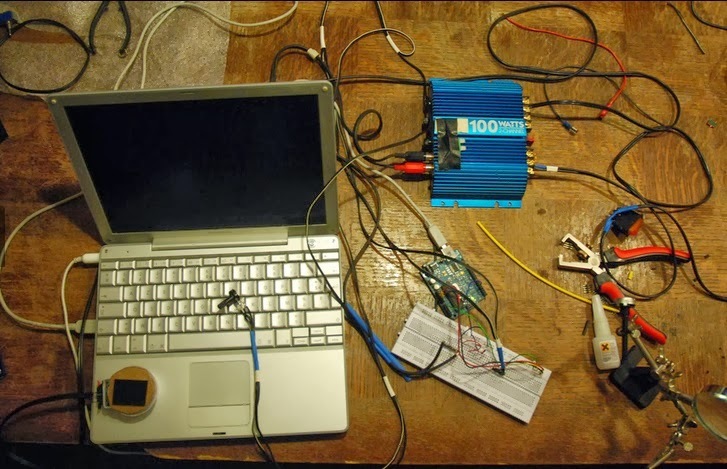 The process begins when the board is attached to a computer (laptop or PC) via the USB port. Once the software creates an interaction between the board and the computer, a set of instructions can be typed, similar to the one above. A bitloader is created that can be stored in the physical memory located on the Arduino board. There are many different versions of the Arduino microprocessor available on the market today. One of the most popular versions is the Lilypad; a wearable form of the Arduino microprocessor. If you have recently seen people wearing shirts that flash messages, it is an example of the Lilypad Arduino microprocessor at work. Other types of boards include the Arduino Uno and Leonardo. If you are interested in learning how to use the Arduino microprocessor as a beginner, here are a few simple projects that may help you get started. There is a simple way to create a single cell battery tester for use in measuring the voltage of your AA, AAA, C or D cell batteries that you may use in a smoke detector or TV remote. If you love board games that use 6-sided dice, try this project to create an electronic pair of dice. Finally, you may use Arduino technology to create your own stop watch for use at home. Myron Prescott writes on computer software, hardware, mobile phones, gadgets, gadget accessories and other related topics. Those with iPhone 5s should consider the iPhone 5s insurance from Protectyourbubble.com to better protect their device.